Worldwide, with highest diversity in the tropics. Larva of Coleoptera or Lepidoptera are stung and paralysed by the adult female who lays several eggs on the larva, which is either left in situ or dragged to a concealed situation such as a crevice. The female may attend the eggs and developing larvae. Pupation occurs next to the host. Alencar I.D.C.C. & Azevedo, C.O. 2011. 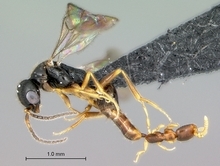 Revision of Malagasy Odontepyris Kieffer (Hymenoptera, Bethylidae). Zootaxa 2935: 26-40. Alencar I.D.C.C. & Azevedo, C.O. 2011. Revision of Neurepyris Kieffer, 1905 (Hymenoptera, Bethylidae), a new synonym of Pristocera Klug, 1808. European Journal of Taxonomy 4: 1-12. Alencar, I.D.C.C. & Azevedo, C.O. 2009. Rediscovery of Planepyris Kieffer: a new synonym of Trachepyris Kieffer (Hymenoptera, Bethylidae). Doriana 8 (363): 1-12. Amante M, Schöller M, Hardy ICW, Russo A. 2017. Reproductive biology of Holepyris sylvanidis (Hymenoptera: Bethylidae). Biological Control 106: 1-8. https://doi.org/10.1016/j.biocontrol.2016.12.004. Argaman, Q., 1988. A new subfamily of Bethylidae allied to Pristocerinae (Hymenoptera). Bollettino della Società Entomologica Italiana 120(2): 139–152. Argaman, Q. 2003. Generic synopsis of Mesitinae [sic] Kieffer, 1914 (Hymenoptera: Bethylidae). Entomofauna 24: 61–96. Ashmead WH. 1893. A monograph of the North American Proctotrypidae. Bulletin of the United States National Museum of Washington 45: 463. Ashmead WH. 1903. Descriptions of three new parasitic Hymenoptera from India. Ind. Mus. Notes 5: 2-3, 171. Azevedo C.O. & Alencar, I.D.C.C. 2009. Rediscovery of Pristepyris Kieffer (Hymenoptera, Bethylidae), a new synonym of Acrepyris Kieffer. Zootaxa 2287: 45-54. Azevedo, C.O. & Alencar, I.D.C.C. 2010. Rediscovery of the Afrotropical genus Trissepyris Kieffer (Hymenoptera, Bethylidae), a new synonym of Epyris Westwood. Journal of Afrotropical Zoology 6: 3-7. Azevedo, C.O. 2010. Review of Afrotropical Dissomphalus (Hymenoptera, Bethylidae), with emphasis on genitalia. Journal of Afrotropical Zoology 6: 9-22. Azevedo, C.O. & Alencar, I.D.C.C. 2010. Rediscovery of Melanepyris (Hymenoptera: Bethylidae): a new synonym of Epyris. Zoologia 27(3): 403-407. Azevedo C.O., Madl, M & Olmi, M. 2010. A Catalogue of the Bethylidae, Chrysididae, Dryinidae, Embolemidae, Sclerogibbidae and Scolebythidae (Hymenoptera: Chrysidoidea) of the Malagasy Subregion. Linzer Biologische Beitrage 42(2): 845-918. Azevedo CO, Garcia R, Gobbi FT & van Noort S. 2015. Insecta, Hymenoptera, Bethylidae: range extension and filling gaps in Central African Republic. Check List 11: 1-4. Barbosa DN & Azevedo CO. 2009. Laelius Ashmead (Hymenoptera, Bethylidae) from Madagascar, with description of two new species. Zootaxa 2170: 1 – 14. Barbosa, D.N. & C.O. Azevedo. 2011. Phylogeny and reclassification of Laelius (Hymenoptera, Bethylidae) and description of four new species. Insect Systematics and Evolution 42(3): 237-275. Barbosa DN & Azevedo CO. 2012. Revision of Mesitiinae (Hymenoptera, Bethylidae) from Madagascar, with description of eleven new species. Zootaxa 3417: 1-44. Barbosa DN, Kawada R & Azevedo CO. 2017. Order Hymenoptera, family Bethylidae Genus Glenosema Kieffer. Arthropod fauna of the UAE 6: 322–335. Benoit, P.L.G. 1952. Bethylidae (Hym.) nord africains nouveaux ou peu connus du Museo Civico di Storia Naturale di Genova. Doriana, Genoa Mus. Civ. di Storia Nat. "G. Doria." Annali 1(27): 1-7. Benoit, P.L.G. 1956. Contributions a l'étude de la faune entomologique du Ruanda-Urundi (Mission P. Basilewsky 1953). Hymenoptera: CXII. Bethylidae. Ann. Mus. Roy. du Congo Belge, Tervuren. Sci. Geol. Ser. 8. 51: 560-64. Benoit, P.L.G. 1957. Un nouveau Sclerodermus vulnérant pur l'homme en Afrique Centrale (Hymenoptera- Bethylidae). Soc. Roy. d'Ent. de Belg. Bull & Ann. 93(-2): 42-6. Benoit, P.L.G. 1957. Hymenoptera - Bethylidae. Exploration du Parc National Albert. Mission G. F. De Witte, 1933-1935. Bruxelles. Inst. des Parcs Nationaux de Congo Belge, Fascicule 88: 1-57. Benoit, P.L.G. 1963. Monographie des Bethylidae d'Afrique noire (Hymenoptera) I. Sous-famille Pristocerinae Tribu Dicrogeniini Tribu Pristocerini, Gen. Pristocera Klug. Ann. Mus. Roy. de l'Afrique Cent., Tervuren, Belgique. Sci. Zool. Ser. 8 No. 119: 1-95. Benoit, P.L.G. 1963. Bethylides nord-africains recoltés pa M. L. Berland. Mus. Nat. d'Histoire Nat. Bull. Ser. 2, 35(1): 82-84. Benoit, P.L.G. 1963. Rectifications à ma revision des Bethylidae (Hymenoptera) africains, Vol. 1. Zool. et de bot. Afr. Revue 67(1-2): 5-10. Benoit, P.L.G. 1967. Un Bethylide nouveau, Cephalonomia mateui n. sp. parasite de Coléoptères xylophages au Sahara. Zool. et de bot. Afr. Rev. 76(3-4): 341-44. Benoit, P.L.G. 1968. Contribution à l'étude des espèces africaines du genre Mesitius Spinola (Hym. Bethylidae). Zool. et de bot. Afr. Revue 77(1-2): 83-94. Benoit, P.L.G. 1981. Bethylidae africains (Hymenoptera). La Tribu Usakosiini. Rev. Zool. Afr. 95(4): 833-42. Benoit, P.L.G. 1982. Bethylidae africains. II. (Hymenoptera). Le genre Kathepyris Kieffer. Rev. Zool. Afr. 96(1): 185-92. Benoit, P.L.G. 1982. Bethylidae africains. III. Le Genre Diepyris Benoid (Hymenoptera). Rev. Zool. Afr. 96(3): 509-21. Benoit, P.L.G. 1986. Bethylidae africains (Hymenoptera): V. le genre Trichiscus. Rev. Zool. Afr. 99(3): 293-98. Bequaert, J. 1924. Un Hymenoptere Bethylide qui piqu l'homme dans les habitations au Congo. Soc. Belge de Med. Trop. Ann. 4: 163-65. Berland, L. 1951. Super-famille des Bethyloidea. Traité de Zool. 10(2): 906-16, 976-87. Brothers, D. J., 1975. Phylogeny and classification of the aculeate Hymenoptera, with special reference to Mutillidae. Univ. Kansas Sci. Bull., 50: 483-648. Brothers, D. J. & J. M. Carpenter, 1993. Phylogeny of Aculeata: Chrysidoidea and Vespoidea (Hymenoptera). Journal of Hymenoptera Research 2: 227-304. Carpenter, J. M., 1986. Cladistics of the Chrysidoidea (Hymenoptera). Jour. New York Ent. Soc., 94: 303-330. Carpenter, J. M., 1990. On Brother's aculeate phylogeny. Sphecos, (19): 9-12. Dahlbom, A. G. 1954.Hymenoptera Europaea Praecipue Borealia. Friderici Nicolai, Berlin 2: 1-412. Gordh, G., & H. E. Evans. 1976. A new species of Goniozus imported into California from Ethiopia for the biological control of pink bollworm and some notes on the taxonomic status of Parasierola and Goniozus (Hymenoptera: Bethylidae). Proc. Entomol. Soc. Wash. 78: 479-489. Gordh, G. & L. Móczár, 1990. A catalog of the World Bethylidae (Hymenoptera: Aculeata). Mem. Amer. Ent. Inst., (46): 1-364. Kieffer, J.J. 1905. Nouveaux Proctotrypides exotiques conservés au Musée Civique de Genes. Ann. Mus. Civico Storia Nat. Genova Ser 3, 2(42): 9-39. Kieffer, J.J. 1905. Description de nouveaux Proctotrypides exotiques avec une planche et und figure dans le ltexte. Soc. Scient. de Bruxelles. Ann. 29(2): 95-142. Kieffer, J.J. 1905. Description de nouveaux Hyménoptères exotiques. Soc. Hist. Nat. Metz Bull. 24: 85-114. Kieffer, J.J. 1905. Proctotrypides. In: Ernest Andrée (ed. ), Species des Hyménoptères d'Europe & d'Algerie. A. Hermann, Paris 9: 65-288. Kieffer, J.J. 1910. Description de nouveaux Bethylides (Hymen.). Ann. Soc. Ent. France 79: 136-140. Kieffer JJ. 1911. Cynipides et Béthylides de l’Afrique du sud (Hymenopt.). Ann. Soc. Entomol. France. 80: 451–462. Kieffer, J.J. 1913. Nouveau microhyménoptères de l'Afrique equatoriale. Lab. Zool. Gen. Agrar. R. Scuola Sup. Agricol. Portici Boll. 7: 105-108. Kieffer, J.J. 1913. Serphides de l'ile de Lucon. Lab. Zool. Gen. Agr. R. Scuola Sup. Agricol. Portici Boll. 7: 189-92. Kieffer, J.J. 1913. Insectes Hyménoptères I. Proctotrupidae, Cynipidae et Evaniidae. In: Voyage de Ch. Alluaud et R. Jeannel en Afrique Orientale (1911-1912). Albert Schulz Paris. p. 5-9. Kieffer, J.J. 1913. Nouveaux Serphides de l'Afrique du Sud. Lab. Zool. Gen. Agrar. R. Scuola Sup. Agricol. Portici Boll. 7: 324-31. Kieffer, J.J., 1914. Bethylinae. In Das Tierreich, R. Friedlander und Sohn, Berlin, 41: 228-595. Kieffer JJ 1921. Nouveaux Bethylides du Soudan Égyptien. Annales de la Société Scientifique de Bruxelles 40: 111-114. Krombein, K.V., 1992. Systematics of the genera of Epyrinae with ramose male antennae (Hymenoptera: Bethylidae). Proceedings of the Entomological Society of Washington 94: 345-360. Lanes, G.O. & Azevedo, C.O. 2008. Phylogeny and Taxonomy of Sclerodermini (Hymenoptera, Bethylidae, Epyrinae). Insect Systematics and Evolution 39: 55-86. Lim J, Azevedo CO. 2014. Five new species of Disepyris Kieffer, 1905 (Hymenoptera: Bethylidae), with emended generic diagnosis. Zootaxa. 3900: 526–540. DOI: 10.11646/zootaxa.3900.4.4. Móczár, L., 1970. Mesitinae of world with new genera and species. I. (Hymenoptera: Bethylidae). Acta Zool. Acad. Sci. Hung.,16: 175-203. Móczár, L., 1970. Mestinae of the world, genera Sulcomesitius Móczár and Metrionotus Móczár. II. (Hymenoptera: Bethylidae). Acta Zool. Acad. Scien. Hung. 16(3-4): 409-451. Móczár, L. 1970. Two new species of Sulcomesitius Móczár (Hym., Bethylidae). Acta Biol. Szeged. 16: 163-65. Móczár, L. 1970. New Mesitinae from Madagascar (Hymenoptera, Bethylidae). Ann. Hist-Nat. Mus. Nat. Hung.Pars Zoologica 61: 317-20. Móczár, L. 1970. 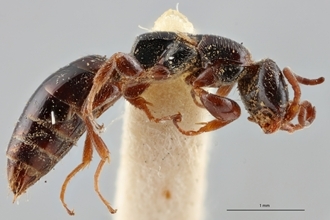 Parvoculus myrmecophilus new genus and new species from Kinshasa-Congo (Hymenoptera: Bethylidae). Opuscula Zool. Budapest 10(1): 151-53. Móczár, L. 1971. Pycnomesitius new genus from Bethylidae (Hymenoptera). Acta Biol. Szeged. 17: 167-69. Móczár, L., 1971. Mesitinae of world, genera "Mesitius Spinola", Pilomesitius Móczár, Parvoculus Móczár, Pycnomesitius Móczár and Heterocoelia Dahlbom. III. (Hymenoptera: Bethylidae). Acta Zool. Acad. Sci. Hung.,17: 295-332. Mugrabi, D.F. & Azevedo, C.O. 2010. Insecta, Hymenoptera, Bethylidae: range extension and filling gaps in Madagascar. Check List 6(1): 62-63. Nagy, C. G., 1969. Sur la sous-famille Mesitinae Berland (Hym., Bethylidae). Agigea Leucrarile Statiunea Zool. Marina, 3: 275-300. Nagy, C. G., 1972. Taxonomic remarks on Mesitinar [sic.] (Hymenoptera, Bethylidae). Mem. Soc. Ent. Ital., 51: 5-18. Nagy, C. G., 1974. A new bethylid subfamily allied to Protopristocerinae. Bull. Soc. Ent. Ital., 106: 126-130. Polaszek, P. & K. V. Krombein, 1994. 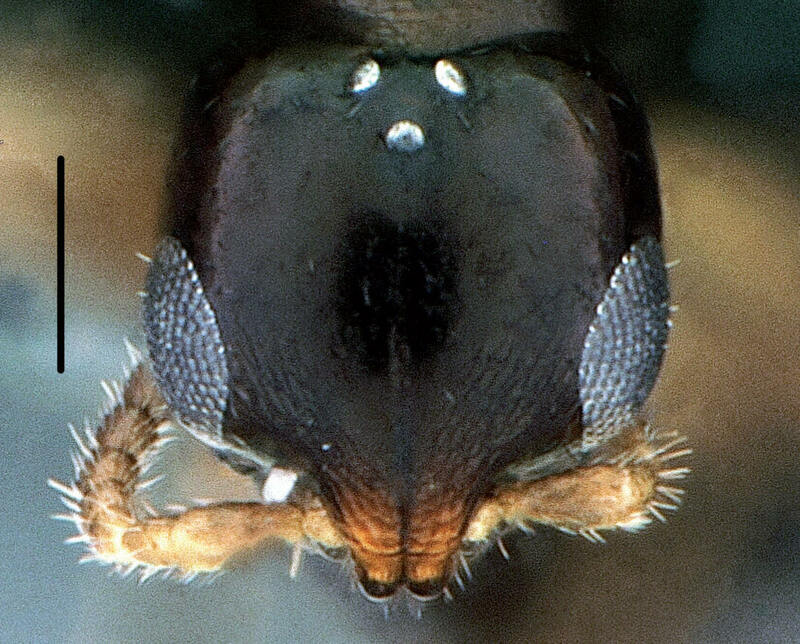 The genera of Bethylinae (Hymenoptera: Bethylidae). Journal of Hymenoptera Research 3: 91-105. Ramos M.S. & Azevedo C.O. 2016. Afrobethylus Ramos & Azevedo, gen. nov., a new remarkable Afrotropical genus of Bethylinae (Hymenoptera: Bethylidae). Zootaxa 4097 (4): 495–510. Stein, P.R.W. & Azevedo, C.O. 2011. Revision of Epyris afer (Magretti, 1884), comb. rev. (Hymenoptera: Bethylidae) with new synonymy and description of two new species. Zootaxa 3032: 17-32. Terayama, M., 1995a. The phylogeny of the bethylid wasp tribe Sclerodermini (Hymenoptera, Bethylidae). Proceedings of the Japanese Society of Systematic Zoology 54: 65-73. Terayama, M., 1995b. Phylogeny and distribution of the subfamily Bethylinae (Hymenoptera: Chrysidoidea: Bethylidae). Bulletin of the Biogeographical Society of Japan 50: 1-9. Terayama, M., 1996. The phylogeny of the bethylid wasp subfamily Pristocerinae (Hymenoptera, Bethylidae). Jpn. Jour. Ent., 64: 587-601. Terayama, M., 2003. Phylogenetic systematics of the family Bethylidae (Insecta: Hymenoptera) Part I. Higher classification. The Academic Reports of the Faculty of Engineering of Tokyo Polytechnic University 26: 1-15. Terayama, M., 2004. Descriptions of new taxa and distribution records of the family Bethylidae (Insecta, Hymenoptera) I. Subfamily Pristocerinae. The Academic Reports of the Faculty of Engineering of Tokyo Polytechnic University 27: 22-38. Turner, R. E. 1915. Notes on fossorial Hymenoptera. XVIT. On new Ethiopian species. Ann. kg. Nat. Hist. Ser. 8. 16: 286-299. Turner, R. E. 1917. New species of Hymenoptera in the British Museum. Trans. Entomol. Soc. London 65: 53-84. Turner, R. E. 1928. New Hymenoptera of the family Bethylidae. Ann. Mag. Nat. Hist. 31: 129-152. Turner, R. E. & Waterston, J. 1916. A new parasite bred from Glossina morsitans in Nyasaland. Bull. Entomol . Res. 7:133-135. Turner, R. E. & Waterston, J. 1917. Notes on the hymenopterous families Bethylidae and Rhopalosomatidae. Ann. Mag. Nat. Hist. 20: 101-108. Turner, R. E. 1928. New Hymenoptera of the family Bethylidae. Annals and Magazine of Natural History 1: 129-152. Vargas JM, Azevedo CO. 2016. Three new species of Pararhabdepyris Gorbatovsky (Hymenoptera, Bethylidae) from Central Africa and the Arabian Peninsula. Zootaxa 4117(3): 429-39. doi: 10.11646/zootaxa.4117.3.10. Waichert, C. & Azevedo, C.O. 2009. Phylogenetic analysis of Rhabdepyris (Hymenoptera: Bethylidae) and redefinition of generic limits based on morphological characters. Zootaxa 2284: 1–29. Westwood, J. O., 1832. Descriptions of several new British forms amongst the parasitic hymenopterous insects. London and Edinburgh Philosophical Magazine & Journal of Science, Ser. 3, 1: 127-129. © Magno S. Ramos & Celso O. Azevedo (Universidade Federal do Espírito Santo).